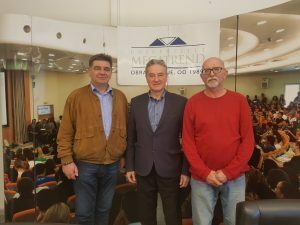 On March 13, 2019, a working meeting was held and cooperation was established with the Independent Trade Union of the National Theater in Belgrade and the Independent Union of Workers of Culture and Art of Serbia. The doors of the Megatrend University remain open to all interested members of these unions and their families for education at all three levels of study programs. Very favorable conditions in the enrollment campaign for 2019/20 have been agreed. With such activities, our university exerts its social responsibility and invests efforts to educate young generations and contribute to the further development of Serbia. On the picture: rector of Megatrend, prof. dr Miodrag Jevtic, Dimitrije Ilic and Zoran Djuricic.